To enhance lives through therapeutic visits with caring volunteers and their pets. To certify and provide caring volunteers dedicated to sharing their pets love by engaging people in a variety of community settings. 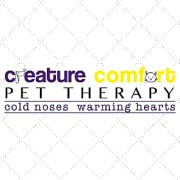 CREATURE COMFORT PET THERAPY accepts donations. Donate Now. Would you recommend CREATURE COMFORT PET THERAPY?